A talent hunt camp is all set to begin at month's end to find young (under-17) qualified football players.The initiative is under the supervision of the state sports department, along with the North Bengal Sports and Games Development Council (NBSGDC). Last month the council had decided to start an Under-17 football tournament in all the eight blocks of the hills following which a talent hunt program will scheduled to be held in Jolung and Gorubathan under Gorubathan Block on 30 and 31 January. 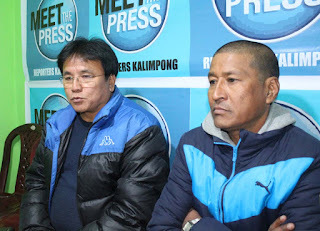 Dhendup Bhutia, member of the committee in Kalimpong,while addressing a press meet at Kalimpong reporters' office said, "After we have finished the hunt at Gorubathan, we will move to Kalimpong Block 2,Block 1 and finally the municipality area. After the hunt has been carried out at all the camps, the Kalimpong subdivision team will be ready, which will contest with teams from Darjeeling, Kurseong and Mirik in Siliguri." He added Hills have a history of giving birth to great football players. "Talent is there and we are giving them a platform," added Bhutia. A sum of Rs 1 lakh each has been sanction for each talent hunt camp, which will be held at block and municipal level. 0 Respones to "Football talent hunt to start from Jan end"